The Alpha Magnetic Spectrometer is transferred out of the space shuttle Endeavour's cargo bay by the shuttle's robotic arm on May 19. This story was updated at 6:52 a.m. EDT. HOUSTON — An expensive, ambitious astrophysics experiment 17 years in the making was installed today on the International Space Station. From its new perch on the station's backbone, the $2 billion Alpha Magnetic Spectrometer will hunt for clues about some of the universe's strangest stuff, from dark matter to antimatter. "It's a great milestone for the hundreds of scientists in 16 countries around the world who've been working on the AMS for more than a decade. It's been our honor, as our crew, to play a role in this huge undertaking," said shuttle astronaut Greg H. Johnson after the device was attached to the station. "It is great news for scientists, engineers and inquisitive people all over the world," responded capcom Lucia McCullough from Mission Control. "Thank you for your skillful work in a very important task — we're just thrilled." Today (May 19), astronauts used robots to perform the carefully choreographed transfer of the bus-sized experiment from the shuttle to the station. Endeavour's six astronauts, who are working the overnight shift during their 16-day mission, woke Wednesday evening at 10:56 p.m. EDT (0256 GMT Thursday). At about 2:30 a.m. EDT (0630 GMT), astronauts operating the space shuttle's robotic arm grabbed the Alpha Magnetic Spectrometer and proceeded to lift it out of the cargo bay. Midway along its journey, the experiment was passed from the shuttle arm over to the space station's robotic arm, which carried the AMS the rest of the way to its permanent home on the station's backbone-like truss. The 7-ton experiment was installed on the space station at 5:46 a.m. EDT (0946 GMT). "Your support and fantastic work has taken us one step closer to realizing the science potential of AMS," the experiment's principal investigator, Nobel Laureate Samuel Ting of the Massachusetts Institute of Technology, told the crew after the experiment was installed. "With your help, for the next 20 years, AMS on the station will provide us a better understanding of the origin of the universe. We wish you a safe return." "Thank you, Sam," Endeavour's commander Mark Kelly responded. "I was just looking out the window of the orbiter, and AMS looks absolutely fantastic on the truss." It represents one of the most fundamental human drives: curiosity, Ting said before Endeavour's launch. "The difference between humans and animals is curiosity," Ting told SPACE.com. "It's curiosity that drives a physicist forward to search for the unknown." "It's a particle detector," Endeavour's pilot, Greg H. Johnson, said in a preflight NASA interview. "It collects various cosmic particles that can't come through our atmosphere to Earth, so this particular experiment can't be on the surface of the planet." But the most exciting discoveries of AMS could turn out to be the ones scientists haven't even thought to predict. "You set up these scientific experiments … and you end up learning something that you didn't expect," Gary Horlacher, the shuttle's lead flight director, said told reporters today. "Hubble's done that, all the great observatories have ended up surprising us. Just like Hubble, I expect it to rewrite our textbooks for a long time." The experiment almost never got the chance to fly. After the 2003 space shuttle Columbia accident, the flight slated to launch AMS was cancelled. It took lobbying by hundreds of scientists, and a bill passed by Congress, to add one more space shuttle mission to launch AMS. The installation of the experiment began with astronauts Drew Feustel and Roberto Vittori controlling the space shuttle Endeavour's robotic arm, called Canadarm 2, to grab onto AMS and lift it out of the orbiter's payload bay. Then the astronauts handed the instrument off to their crewmates, Greg Chamitoff and Johnson, who were controlling the space station's robotic arm. 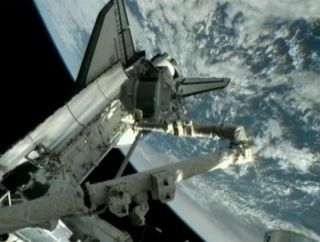 The station arm attached to the AMS and carried it over to its permanent destination on the lab's starboard-side truss. "We have been waiting for this day a long time," Vittori said. "Everything went very smoothly, the robotic arm performed perfectly." Orbiting cosmic ray instrument may have found evidence of dark matter. The overall maneuver to transfer AMS from shuttle to station took about two and a half hours. "It takes quite a few hours; it’s a tricky operation," Chamitoff said in a preflight NASA interview. He pointed out that the attachment mechanism used to install the AMS doesn't have the same level of redundancy, or backup equipment, in place in case it fails. "I'll be breathing a little better after that's been completed and I know that it's attached successfully, just because we don't have the redundancy there if something does go wrong." The instrument will be turned on shortly after installation, and should begin recording data almost immediately. Results from the experiment, however, won't be available for months because scientists will need time to collect and analyze its many measurements. While the shuttle crew has been focused on AMS today, some mission managers are investigating a few small patches of damage discovered in the shuttle's heat shield. The patches were revealed by a detailed scan of the heat shield tiles conducted by the astronauts on their first full day in space on Tuesday, as well as by high-resolution photos of the shuttle's underbelly made during a special maneuver as Endeavour approached the International Space Station before docking. The largest of the damaged areas measures almost 7 inches (18 cm) across. "This is not cause for alarm, this is not cause for any concern," LeRoy Cain, chair of the shuttle's mission management team told reporters Wednesday. "We haven't done enough work yet to be able to determine whether or not there's any more information or assessment we need. We're in the throes of doing that work right now." If more data is needed to assess whether or not the damaged tiles pose any threat to the shuttle during re-entry to Earth, mission managers may elect to have the astronauts conduct an optional second inspection later on in the mission. Endeavour is in the midst of a 16-day mission to deliver the AMS and other equipment to the International Space Station. The mission is the 25th and final spaceflight for the shuttle before it is retired this year along with the rest of NASA's orbiter fleet.